The choice for getting your best friends the long bridesmaid dresses style means that you will definitely plan your special day in a formal style. The option for full length of a dress seems to have been more rarely considered in the late years, although a few brides have taken it into account for vary reasons. Some of these reasons go for allowing plus size friends to look slimmer adding to the full length the choice of darker shade of color as well. It is known that with these two choices a full rounded silhouette will look much slimmer, especially in the wedding photos. If you take a look inside the online bridal stores, you will find that the option for long bridesmaid dresses is not that popular among the fashion designers, but inside the land based bridal stores they come in a large number. Just go shopping for these full length dresses inside your local stores selling cocktail attires and you will find beautiful creations maybe not of the famous names in the industry, but very classy in style, color and choice of fabric. 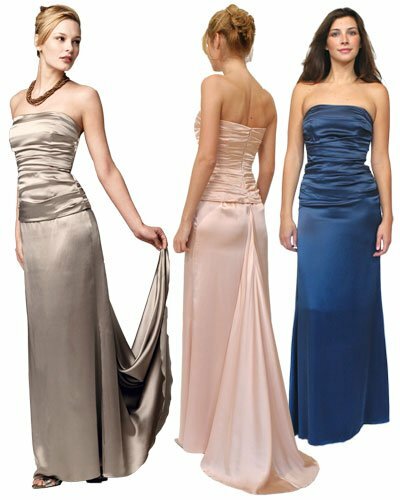 You will find sleeveless long bridesmaid dresses make of delicate silk flowing all the way down to the floor some of them even with a tiny train that is left behind while walking down the aisle to prepare the bride entrance. If you have found some styles online which you can not find inside your local stores, one idea would be to have these ones sewn by a professional seamstress. They will always know what type of fabric will go for that style and together you can as well choose the appropriate color following the color scheme of your wedding celebration.